Members of both the Research Programmes and Research Support Teams at the MRC Epidemiology Unit take part in a wide range of public engagement activities throughout the year, where they showcase and discuss their work with different audiences. We work closely with the MRC Head Office public engagement team and University of Cambridge Public Engagement. 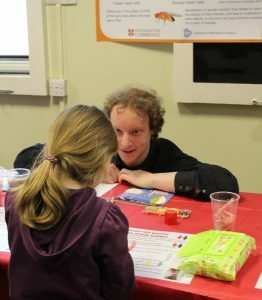 These include regular participation in Science Festivals such as the Cambridge Science Festival and MRC Festival of Medical Research, Cambridge University Fun Lab at the Big Weekend, and Big Biology Week where events range from hands on activities for families, to talks and panel discussions, to careers events for secondary school pupils. We also hold public meetings for volunteers in our research studies. The Fenland Study public meetings held in Cambridge, Ely and Wisbech in 2016, included a talk by Study chief Investigator Professor Nick Wareham, followed by a Q&A session with a panel of Fenland Study researchers. In addition to these large events that involve many members of the Unit, individual Unit researchers take part in a wide variety of activities. In 2017 Unit scientist Dr Tarra Penney and Cambridge artist Aurora Cacciapuoti developed “Great Snackington – where healthy food can be hard find” as a fun way to explore how our neighbourhoods can influence what we choose to eat and drink. We’ve since taken it to public spaces in the Cambridge area so people can learn more about what we do and why it’s important. Sonja Klingberg, a PhD Student with our Behavioural Epidemiology programme, was recently shortlisted for the 2017 Max Perutz Science Writing Award.